Why are Stretching Exercises Helpful? Did you know that vigorous exercise shortens your muscles? Stretching exercises encourage the lengthening of your muscles and their associated tendons to assist in normalising your muscle length and tension ratio. Muscles shorten during exercise, from general postural habits and ageing and disuse. If you only use a small amount of your muscle length range, your muscle will adapt over time and shorten to that length, under the “use it or lose it” premise, that your body naturally attunes itself to. When do Stretching Exercises Help? By lengthening your muscles via stretching, you promote flexibility and your ability to have a full range of motion about your joints. Studies comparing a warm-up that includes static stretching, with a warm-up that does not include static stretching, have shown that although pre-exercise static stretching does improve flexibility, it does not appear to prevent injury during exercise. Therefore, the type of pre-exercise stretching technique used, needs to be an active style of stretch, to prepare you for the high load of muscle activity, during your sport, rather than solely for tissue elongation. It is the warm up and the use of a dynamic stretching program that prepare you for sport that appears to have the most beneficial effects. It is important to stretch your muscles only when they are warm, as cold muscles are more likely to tear. 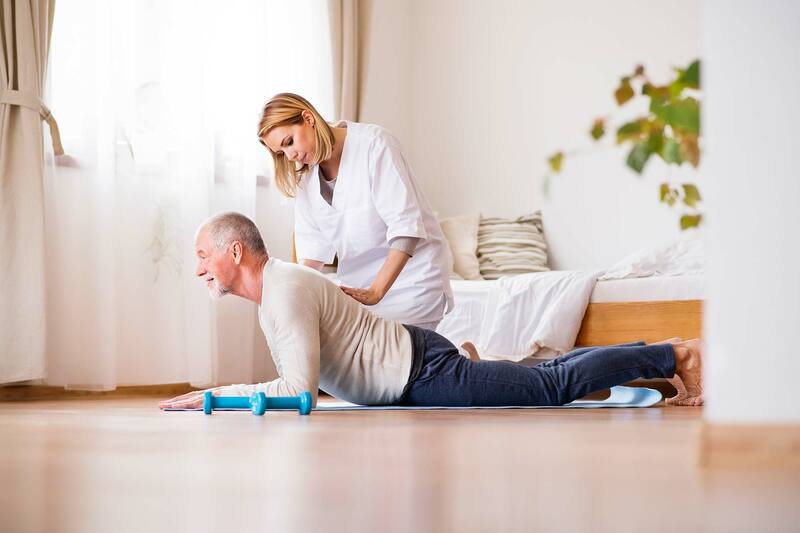 The stretches that you perform vary depending on whether you are preparing for exercise, recovering from exercise, or rehabilitating from injury. Here are some general stretching guidelines. What Stretches Should You Do Before Exercise? Before you exercise it is a good idea to warm up your muscles to prepare you for the rigours of exercise. You could think of warming up like a car engine; you want to warm it up before your roar down the street. The ideal pre-exercise stretching program includes a general warm up eg light 5 minute jog until you can feel some warmth in your muscles. Then, you can perform some slow sustained static stretches ideally for 20 to 30 seconds. Your stretching exercises should be modified by increasing their speed and power in a progressively graduated order that prepares you for the skills and muscle demands for your sport or chosen exercise session. By the end of your warm up you should be performing plyometric or bounce style exercises that replicate your sport’s requirements. An ideal time to do most of your static stretching is after exercise, that is, immediately after your post-exercise cool-down. Allow around 5 to 10 minutes to stretch after exercise, and concentrate on the muscles that you have just exercised. Use the static stretches rather than bouncing style stretches. Stretching at this time helps restore your muscles to their resting length and prepare them for your next exercise session. While cool down stretches improve your muscle length and joint flexibility that helps you to improve sporting or athletic performance. A light static stretching routine (stretching a muscle and holding it in this position without discomfort for 20-30 seconds) can be performed at the end of a warm-up, before undertaking more vigorous activity. Be sure to stretch each of the muscle groups you will be using in your chosen activity 2 to 3 times. Specific stretching for target muscles that have been identified by your physiotherapist should be performed daily or as directed by your therapist using the techniques that they feel will assist you to reach your flexibility goals. Warming up for a dedicated stretching session might involve 2 to 3 minutes of jogging or doing your favourite exercise at low intensity for 5 minutes. Raising a light sweat will indicate warming of your muscle tissue. Alternatively, attending a yoga class is an enjoyable way to contribute to the flexibility part of your fitness programme. Static stretching is considered the safest method of stretching. A static stretch should be held for 20 to 30 seconds at a point where you can feel the stretch but do not experience any discomfort. If you feel discomfort, ease back on the stretch. Do not bounce when holding the stretch. Ballistic stretching as stretches performed at speed and prescribed by your sports physiotherapist or elite sports coach. They are often used as a part of your warm-up for sport or training. Dynamic stretches involve muscle movements that move a joint through the full range of movement that will be required in your chosen sport or activity. For example, if your chosen activity requires sudden bursts of power, such as jumping or sudden acceleration, then specific ballistic stretches under the direction of your physiotherapist or coach may be advised as a part of your warm-up. The technique of PNF stretching was first developed as a muscle therapy but is now used by athletes as a means of enhancing flexibility. PNF stretching is often used by physiotherapists. More information can be sought by seeking their advice in your situation. Stretching can be used as a corrective, preventative and recovery strategy. More specific stretching advice can be sought from your physiotherapist. For your specific muscle length assessment and prescription of the best stretches for you, please contact your physiotherapist.